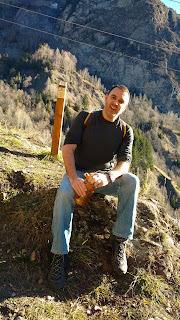 Our final day in Venosc and Les Deux Alpes was spent walking. Our six-day ski-lift passes had expired and so we only paid enough for the cable car up to the town, so wherever we went it was going to be on foot. We chose to follow signs from the south side of the town up to Pied Moutet, a forested mountainside. It was a hard slog up to the top and people would normally do it via the ski lift, but with this side of the valley being more grass than snow, the ski lift wasn't running. We took our time walking to the top, pausing dozens of times to sit or lay in the sun. The view below was stunning, looking out across more of the alps, or down over the skiing town and our village campsite base even further below. As we neared the top, the grass began to give way to snow until we arrived at the summit to see nothing but white. We had one requirement for our first ever holiday at Christmas: it had to be white. The website for Camping Caravaneige Champ du Moulin shows snow on the ground while promising a site fully equipped for winter camping. It lived up to the promise on all counts. We arrived just as an unseasonably warm spell arrived and although snow around the valley began to disappear during the week, it remained on the ground in the campsite for the duration. The site is five minutes walk from Venosc village which is further uphill. When you check the weather for Venosc you'll see temperatures several degrees warmer than it will actually be on the campsite which sits at the bottom of a valley, entirely in the shade during winter. So we got our white Christmas, waking up on Christmas Day with snow all around, and the benefit of it being a little warmer when we went out each day. We celebrated Christmas two weeks early with my family since we'd be in the alps on the real Christmas Day. We cooked a proper, traditional Christmas dinner for six with all the trimmings in the relative luxury of our small kitchen. So it wasn't really necessary to do it all again on 25 December for the two of us in a campervan that has no kitchen. The campsite electricity was 10 amps. That meant we could use 2,200 watts at any one time. So our festive feast required meticulous planning so it could be prepared using one electrical item at a time. First, in a saucepan on our electric hob, we par-boiled the potatoes, followed by 25 minutes for the Brussels sprouts. The hob was then unplugged, but we put the carrots in the still-hot water. It was -3°C when we got up this morning on our last day in Venosc, at Champ du Moulin campsite in the French alps. Despite the outside temperature we've been very cosy in our VW T5 California campervan, but that's through thorough preparation and having the right accessories. Most important, I think, has been the insulated screen from Pucer Screens. A silver insulated layer that wraps around the pop-top roof. We purchased it for around £120 a couple of months ago from a small business in the UK. It was delivered in a couple of days and fits perfectly. Then we've got a further layer in the Cali-Topper we've had from day one. It's a military-grade fabric protective cover which we've used in all seasons. At £400 it is quite pricey but it keeps the wind out and the rain off. After a year of camping our van's roof fabric is as clean as the day she rolled out of the factory because it isn't exposed to the elements. We packed a huge amount into today. First we took the ski lift to the top of the mountain and walked down. We demonstrated that we were ski lift rookies when the operator had to shout at us to lower the safety barrier. After a leisurely walk down the mountain we had an hour in an outdoor pool soaking up the sun. It brought back memories of sitting in outdoor pools in Reykjavik a couple of years ago. It's so amazing to be in a pool when the outside temperature is so low and the scenery is stunning. It doesn't quite live up to Iceland because there we sat in bath-hot water while it hailed and that's pretty hard to beat. Not willing to risk their being available on Christmas eve we bought a turkey and Brussels sprouts ready for our Christmas dinner - no refrigeration necessary, we're just going to leave them outside in the box with our walking boots. We've fallen into an easy routine, as we generally do on a holiday, of getting up around 9am, putting the coffee machine on and collecting freshly baked pain so chocolat from reception. After showering we're on the cable car to Les Deux Alpes before 11am. Yesterday we had lunch at La Bergerie Kanata in Mont de Lans after waking up the mountain behind the town. We hadn't expected to find a restaurant up there but in the sunshine it seemed to good an opportunity to pass up. We ordered two espressos and enjoyed them at a picnic table. The sky was clear blue and the sun was warm on our faces. Coats were removed and sleeves rolled up. It was glorious. And then I looked at the menu, finding that we could enjoy a litre of wine for €13. It was still 11.45am and so we felt it wasn't really right to be ordering alcoholic beverages just yet. We waited fifteen minutes and ordered rose wine and two salads that turned out to be huge. We put on the oil-filled radiator; the campervan's diesel heater was on low. We had set the electric blanket to its lowest setting. With the dinner, of meatballs and lentils in red wine, simmering we spent half an hour in the campsite's sauna. After dinner we played a couple of boardgames and enjoyed a few glasses of wine. Climbing into the rooftop bed it was lovely and warm and stayed that way throughout the night. Around 1am I had to turn off the diesel heater and electric blanket as I was too warm. I'd most dreaded the walk to the loo in the night, but when I ventured out in my flip flops and pyjamas it was awesome. Lights twinkled on the Christmas tree by reception and the sky was so clear I could see all the stars shining down on the crisp white snow that crunched underfoot. It was no hardship at all. It seemed magical to be here at all. Yes the alps. Yes at Christmas. Yes in a campervan. Are we mad? Too soon to say. So here we are in the French alps in December in a pop-top campervan. The campsite website says the weather here rarely dips below -15°C. That's reassuring, haha. It looks promising after an exploratory walk. I took off my hat, scarf and gloves because I was too hot. Our village looks lovely and we can get a cable car up to the bigger skiing town above. Time to bed in for the night and see if we can stay warm enough. We took Cleopatra for her first camping trip to Brighton this weekend. We've camped, in a tent, at Sheepcote Valley more times than I can remember, so it is hard to believe we've been taking weekend trips since January and yet this is the first time we've been to Brighton in our campervan. This Caravan Club site gets fully booked regularly, as on a couple of occasions we've tried to book with a week or two's notice and been unable. It's well located to the east of Brighton with the sea front only 15 minutes walk and the centre of Brighton less than an hour away. Several bus routes are 10 minutes or so away and a taxi into town is less than £10. It's been a very windy weekend. The wind has been blowing from the south, off the sea. It then makes its way up the valley and through the campsite. We were a little more sheltered than it felt on the sea front, but it was about as windy as I'd have been comfortable with having the pop-top roof up with. On Friday I was at a work conference in London and so we booked a campsite easy for me to get to after the conference had finished and that Tony could get to at a similar time after he finished work. We chose North Hill Farm in Chorleywood, about as far west as the London Underground would take me. As it turned out, I received the very kind offer of a lift from the conference right to the campsite and arrived around 5.30pm. I knew Tony was only five or ten minutes away from arriving himself and that was blessing since it was pitch black. After stumbling around in the darkness I hadn't managed to find a sign for the campsite reception during my wait. We took delivery of Cleopatra in January and have been camping with her since then. That means we've already camped in all seasons. I don't really remember the beginning of the year being particularly bleak, though I know it was - there are photos of us in snow. I think the novelty of having a campervan to call our own was still such a novelty we just didn't notice the weather. Then summer came along and really spoiled us. We'd arrive on a camp site at 6 or 7 o'clock in the evening, crack open a few beers and watch the sun go down. That all seemed to change really quickly and on our last two camping trips we've arrived in the pitch black. I didn't think the return of winter would put me off camping but on Friday it nearly did. We arrived at Cliff House camp site in Dunwich, near Southwold at 6.30pm. It was pitch black and raining. Reception had closed and our name and allocated pitch was on a sheet of late arrivals stuck to the door. We've spent a week of mooching - that's the best way to describe it - around Strasbourg. We didn't have any agenda; we just let the city take control of our actions. Most days we walked into the centre with its quaint old town and vibrant new shopping streets. We looked in shops, bought groceries, and meandered along the canals. On three days we ate lunch at Le Grand Shanghai where an all-you-can-eat buffet was just €12.95. It goes without saying I'd recommend the place with three visits in a week. It really is a bargain price for one of the best Chinese buffets I've ever eaten.